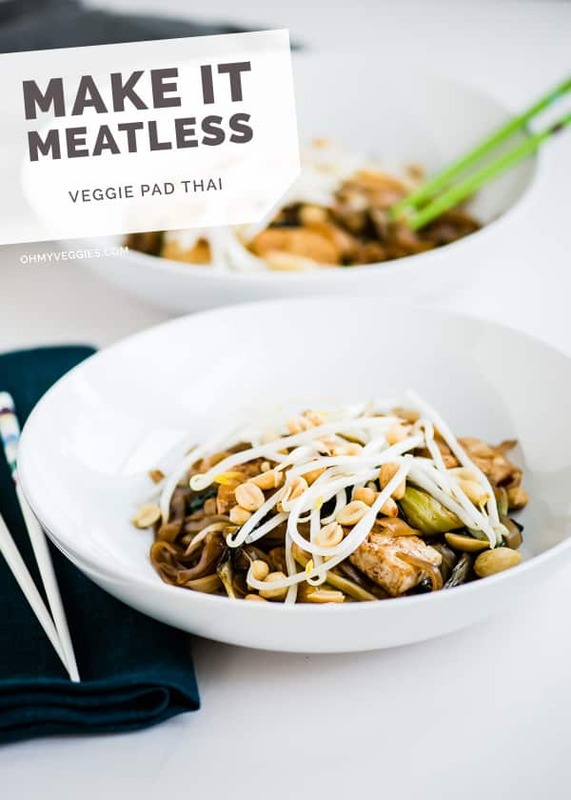 Vegetarian Pad Thai Recipe - a veggie treat from Oh My Veggies! Pad Thai was the first Thai dish I ever tried while dining out. For years after that I gobbled the stuff, eventually expanding my horizons to curries, stir-fries and all sorts of other Thai delights. It was a new vegetarian’s dream. I was in bliss, until one dark day when a helpful server noted that I had requested tofu Pad Thai (as opposed to the other option, which was probably shrimp), “…because I’m a vegetarian.” That was when I learned that Pad Thai is typically not vegetarian. Nor, sadly, were many of the curries and stir-fries I’d also been enjoying. The culprit: fish sauce. Oh what a sad, sad day that was. Can there be anything worse than going home from a Thai restaurant hungry? It hurts to think about it. I still go out for Thai. I’ve learned that lots of places will leave the fish sauce out if you request it, for a truly vegetarian Pad Thai. I’ve also learned that making your own Thai food at home isn’t that difficult. Happy day! You have the option of including tofu and eggs in my version. Tofu replaces the shrimp and adds some protein. The eggs add a touch of authenticity but are certainly not required, and leaving them out makes the dish totally vegan, for those who prefer to roll that way. 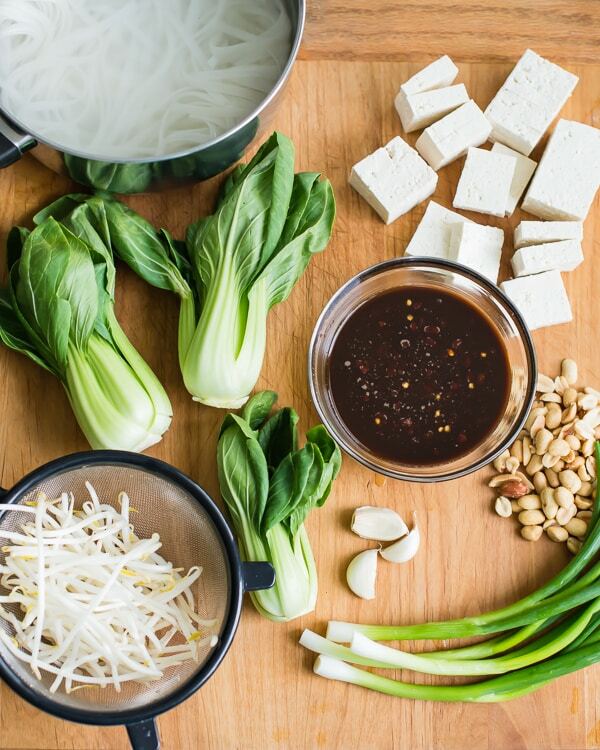 Rice noodles, bok choy and scallions — plus tofu and eggs if you like — tossed in an an authentic-tasting tamarind sauce and topped with sprouts and crunchy peanuts. This truly vegetarian Pad Thai quells our taste for take-out. Add the sauce ingredients to a small bowl and whisk together to combine. Set aside. If using tofu, heat a small amount of oil in a large skillet over medium-high heat. 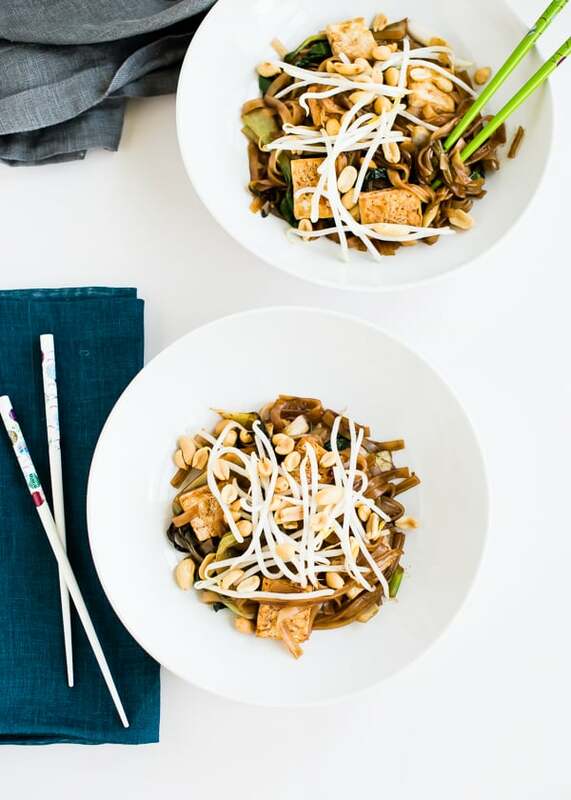 Place the tofu strips into the skillet and cook 3-5 minutes on each side, until golden brown. Transfer to a paper-towel-lined plate and set aside. Fill a large saucepan or stock pot with water. Bring to a boil and remove from heat. Add the noodles and allow them to soak until just a little firm — think one step ahead of al dente. This normally takes about 8-10 minutes, but since different brands may vary, refer to your noodle package instructions. Once the noodles are done soaking, drain them in a colander and rinse with cold water. Separate the baby bok choy into individual leaves and slice each one lengthwise into 2 or 3 strips. Place oil in a wok over medium-high heat. Add the garlic and baby bok choy. Stir fry until the bok choy just starts to wilt and turns deep green, about a minute. Add the noodles and sauce to the wok. Stir fry until the sauce thickens and the noodles are tender, about 3 minutes. If you’re using eggs, push the noodles to the side of the wok to create a little space. If the wok looks a bit dry at this point you can add another splash of oil. Add the eggs into the space you’ve created and break them up with a spatula; scramble for about a minute. Do your best to keep the eggs separated from the noodles until they’re cooked. Add the scallions and tofu to the wok. Stir fry everything for another 30 seconds or so, just to get everything hot and the flavors blended. Remove from heat. Divide the noodles onto plates. Top with peanuts and bean sprouts. If you’re not into baby bok choy, or it just isn’t available, feel free to sub other veggies. Snow peas, carrots, baby corn and broccoli all work great. You’ll need about 3 cups of whatever vegetables you use. Any neutral-flavored cooking oil that you have on hand can be used for this recipe. I love it too! Thank you!!! This will definitely satisfy your tofu cravings! I hope you enjoy it!! This Pad Thai looks great! That fish sauce (and oyster sauce) is so sneaky! I really struggled while traveling in Thailand and ended up just not asking if there was fish sauce in something because there was fish sauce in EVERYTHING! This version looks awesome, and I just happen to have some tamarind paste kicking around. Yum! Thank you, Katie! I was so bummed when I found out that this dish usually includes fish sauce. Traveling through Thailand with all that amazing food having fish sauce sounds like it would be torture!! Yes! I’ve been looking for recipe for Pad Thai Sauce (without the fish sauce) for ages! I’m drooling over this beautiful dish. Lovely! This veggie pad thai is rocking my world! You seriously make me not afraid to try tofu! Looks great! You’re right that a lot of peanut noodle recipes out there claim to be pad thai- delicious in their own right but no, not pad thai! Love tamarind and have half a jar in the fridge to use so this is perfect. Thanks Emma! Yeah, as much of a peanut sauce addict as I am, sometimes I just want some authentic Pad Thai. Love pad Thai so much. This looks great and healthy! I LOVE the vegan/vegetarian Thai recipes, however, can I challenge you to make a vegetarian or vegan Thai Drunken Noodle dish? I have tried many times at home to make it without the fish sauce and gluten free by substituting Bragg liquid Aminos for soy sauce, but it just doesn’t taste the same. I love a challenge! I also love drunken noodles, though I’ve never actually had the dish with fish sauce, but I have plenty of taste testers who have. I’ll certainly give it a shot! Yay! Thank you for the pin – enjoy!! Just a thank you for the best late breakfast on the planet. Your recipe is so clear that it makes it easy to improvise with whatever’s in the larder. I’ve been keeping some ground rice around (a la Andrea Nguyen) for coating the tofu so did that. No tamarind so a little sauce with light soy, mirin, and that delicious umeboshi plum paste, diluted with water. Oh, and I soaked a piece of Kombu in the sauce to give it that ocean flavor. All-in-all, not really pad Thai, but something completely delicious that will serve me well all day. Oh happy day is right!! I have tried many a time to recreate pad thai at home and just haven’t been able to do it. Which is just sad. So happy to have this recipe in my life!! This did not turn out well for me at all. Overpowered by tamarind…sauce was way to thick. I didn’t use the eggs, which may have been part of it. I’m sorry to hear this didn’t work out for you. The eggs are an optional ingredient and we tested the recipe with and without them, so that shouldn’t be the problem. The tamarind paste I used was Laxmi brand. I know there are some other products like tamarind pulp – I haven’t used this, but I’m thinking it could result in a stronger flavor if you used it. Otherwise, it might just be an matter of personal preference, in which case you could decrease the amount of tamarind paste or cut back on the sauce to get something a bit milder. I hope that helps! If not, feel free to throw some questions my way or let me know if there’s anything I can do to help pin down the issue! I agree with Erin. If we try it again, I’ll cut the tamarind by a lot- at least half. I appreciate the feedback. I’m sure I’ll be making this again, so I’ll take your suggestion and see how it works out with less tamarind. I may try a different brand as well, to see if the strength is different. Thanks Kate! I was really excited to try your recipe tonight and immediately knew once i mixed the sauce with the noodles the tamarind was WAY too much, I’m curious to try again with maybe 1/3 of what you posted, it’s definitely not preference, maybe brand changes the concentration or something. I will look for what brand I used later. Neera’s brand, bought from Whole Foods in Austin, TX. Thanks for your input! I haven’t tried that particular brand, but it does sound like there’s some variation, so I’ll have to try some others. Once again, you’ve provided a delicious vegetarian option for a takeout favorite! I’m always crazing Thai food! Thanks for this recipe….always healthier to make your own takeout! This was a great recipe ! Awesome! Glad it helped! Thanks so much Arshia! Had a pad thai craving and found this recipe. I made it tonight – really delicious! I added the tamarind bit by bit and tasted it to check it was to my taste. Also added in a small teaspoon of peanut butter to the sauce, and a squeeze of lime at the end. For those that had trouble with the sauce thickening – you probably need your wok/pan hotter. I put it in the wok and got it bubbling before chucking the noodles in. I’ll definitely make this again!